Writing a letter to a friend in Arabic! 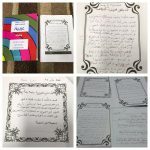 Key stage 3 have been writing letters in the Arabic language. The students got a chance to put into words what they have learned about grammar and vocabulary. They also constructed phrases and expressions, both by using a dictionary and from what they have learned in general.